Since its launch at the end of 2015, the founders of NEW DIPLOMACY have engaged with national governments, local authorities, intergovernmental organisations and private foundations to promote more participatory democracy and a strengthened role for civil society and independent media. In 2016-17, with the support of the National Endowment for Democracy (NED), New Diplomacy ran a highly successful Eastern Partnership Journalism Fellowship scheme. Five fellows – three journalists from Ukraine, two from Georgia – were selected for the first fellowship round. The host organisations were internationally recognised media institutions, namely Hamburger Abendblatt, Spiegel Online, and ZDF public television in Germany, DELFI/Lithuania Tribune in Lithuania, and Eastbook.eu in Poland. Leila Alieva is an Academic Visitor at St Anthony’s College, Oxford University, and continues to provide analysis on political and security developments in the South Caucasus for a variety of think-tanks, publications and media, including as co-author of EU Relations with Armenia and Azerbaijan, a recent study for the European Parliament. Jan Piekło has been serving as the Ambassador of Poland to Ukraine since September 2016, working to advance the role of civil society and to support Ukraine's democratic reforms and Euro-Atlantic integration at a crucial stage in the country's history following the annexation of Crimea by Russia, the conflict in Eastern Ukraine, and the entry into force of the Association Agreement between Ukraine and the European Union. Krzysztof Bobiński is the co-Chair of the Eastern Partnership Civil Society Forum in 2018, where he is working to engage with the EU and its member governments to ensure that civil society has a seat at the table when key policies are debated in intergovernmental fora. He is pressing the European Commission, the European External Action Service and national governments in both the EU and Eastern Partnership countries to prioritise key reforms across the region, including free and fair elections, independent media, and an independent judiciary. Jeff Lovitt conceived, and served as lead author and editor of, two Council of Europe studies on Civil Participation in Political Decision-Making in the Six Eastern Partnership Countries – Part One. Laws and Policies, published in 2016; Part Two: Practice and Implementation in 2017. Since September 2016, he has been a member of the International Experts Panel (IEP) of the Open Government Partnership (OGP). In 2017-18, he is launching a new participatory democracy academy, first piloted with the Council of Europe at the municipal level in Kyiv, Ukraine. If you want to read more about the founders of New Diplomacy, click here. 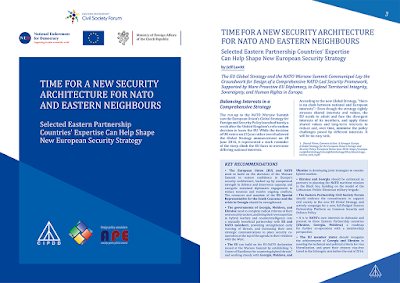 New Diplomacy partnered with the Caucasus Institute for Peace, Democracy and Development (CIPDD), Georgia, in 2016 on the project, Security Alert on the EU's Doorstep, and in 2017 with the Eastern Partnership Civil Society Forum on the publication, Eastern Partnership Index 2015-2016. Charting Progress in European Integration, Democratic Reforms, and Sustainable Development. New Diplomacy will continue to engage through both formal and informal channels with governments, foundations, and civil society in strengthening participatory democracy, and in putting strategic thinking and security at the heart of international relations. We will continue to share with you our news – and analysis of important news from other sources. In 2017, New Diplomacy was given a new look, and the website was re-designed. The website will continue to evolve, sharing with you analysis on many of the important challenges around the globe, and you can also follow us on twitter and join our Facebook group.